Paula Johannesen has been playing the violin since the age of two. She “chose” violin because there was already a string bass player and two cellists in the family and no other instrument would fit in the car. It ended up working out and she is very active in the Chicagoland musicscene. Because she wanted to expand her marketability, Paula picked up the viola around age 10 and still plays it frequently today with orchestras. 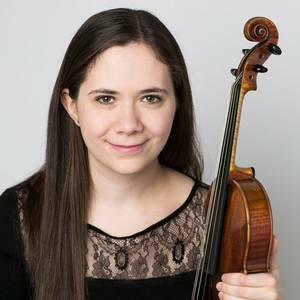 She frequently plays violin with the Chicago Composer’s Orchestra, Chicago Symphonic Pops, New Philharmonic, Symphony of Oak Park and River Forest, Wheaton Summer Pops, where she is principal second violin, and most recently she finished her tenure with Civic Orchestra of Chicago. Paula has performed all over the world, from Carnegie Hall in New York, Matsumoto Castle in Japan, to the American Embassy in Luxembourg. Paula started teaching right out of High School, studying Pedagogy in Undergrad, and taking Suzuki teacher training at the American Suzuki Institute and the Chicago Suzuki Institute. She teaches all ages of violin and viola students, from age 3 to adult. In 2014, Paula joined The Whiskey Brothers, an Irish band based around Chicago. She also has been a Fiddler in more then one production of Fiddler on the Roof, and plays other styles, from Bluegrass to Heavy Metal. She is a founding member of Greenleaf strings, a string quartet, trio, or sometimes even a duo. Paula received her Batchelor’s in Violin Performance from the University of Illinois, where she also studied Voice and Viola. She received her Master’s in Violin Performance from Chicago College of Performing Arts at Roosevelt University in 2014. Paula is a student of David Taylor, assistant Concertmaster for the Chicago Symphony Orchestra. When she’s not playing, listening to, watching, studying or thinking about music, Paula enjoys writing, reading, losing at Mario Kart, encouraging people to use the Oxford Comma, and occasionally sleeping.